On Oct. 2, 2006, Matthew Swatzell headed home after working a 24-hour shift as a firefighter/EMT in Dacula, Ga. He was only a few miles from home when he nodded off for just a couple of seconds, crossed over the center line of the road and crashed into another car. Inside the car was a young woman, June Fitzgerald, who was seven months pregnant with a baby boy, and her 19-month-old daughter, Faith. At the time, Erik didn’t know much of what happened, but as soon as he got to the emergency room and was ushered to the pre-counseling room, he knew it wasn’t good. Erik had little time to process as he had to get to Children’s Hospital of Atlanta, where his daughter had been taken by ambulance. When he got to the other hospital and found out that Faith had survived, he was thankful, but he began to break down as the weight of all that happened started to sink in. Two days after the accident was a day when Erik would normally lead his student ministry. The regular meeting was canceled, but Erik agreed to let the middle schoolers and high schoolers come over to his house. In that moment, Erik was reminded that there was somebody else involved in the accident and that he wasn’t the only one hurting. He realized that this was an opportunity for him to put into practice the forgiveness he preached. 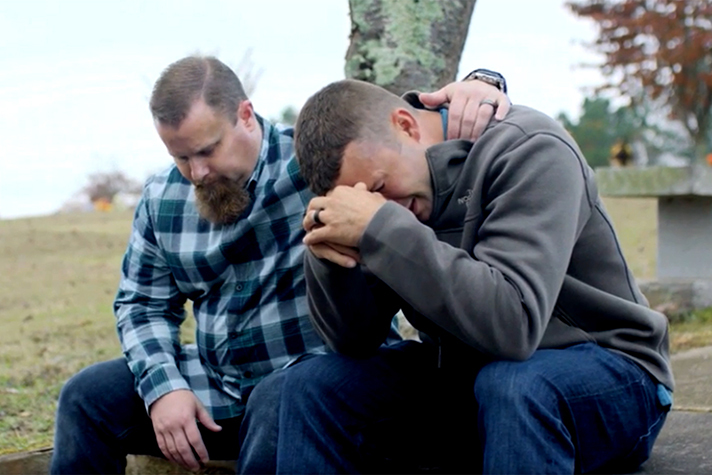 Although he was heartbroken by the loss of his wife and son and preparing for life as a widower and single father, Erik decided not to press any charges against Matthew, but instead, chose to forgive him. Due to legal proceedings, the men were not allowed to communicate until the case was closed. It wasn’t until the day before the two-year anniversary of the accident, in a grocery store parking lot, that they connected, and a life-changing conversation took place. From inside the store, Erik noticed Matthew. “He was just kind of standing outside of his truck, and tears were coming down his face. So I just walked up and gave him a hug. “I didn’t want him to let the accident define him,” Erik said. “I wanted him to know that God’s got a bigger plan than this. I didn’t want him to let this hold him back or be baggage that he carried the rest of his life. From that moment on—for more than 10 years now—the two men have remained friends. They get together several times a year and they try to talk at least once a month. The forgiveness that Erik extended to Matthew formed the foundation of a friendship that has changed both their lives. Though it wasn’t the easiest thing to do, Erik chose to obey God’s Word, which says, “Be kind to one another, tenderhearted, forgiving one another, as God in Christ forgave you” (Ephesians 4:32).